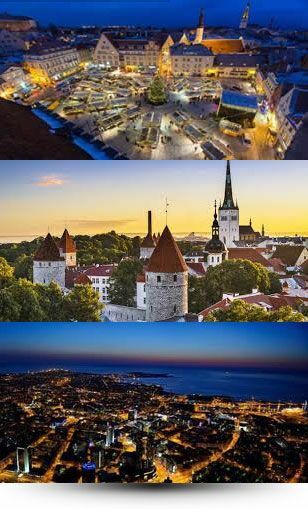 11Tallinn, the capital of Estonia, is truly one of the gems of Northern Europe. The city lies on the southern coast of the Gulf of Finland, only 70 km (43 miles) south of Helsinki. At the historical heart of the city is the hill of Toompea, covered in cobbled streets and filled with medieval houses and alleyways. The lower town spreads out from the foot of the hill, still protected by the remnants of a city wall. Around the city wall is a series of well-maintained green parks, great for strolling. While the old town has been astonishingly well preserved and was inscribed on the UNESCO World Heritage List in 1997, it is now in better shape than ever, with the bigger roads converted into fashionable shopping streets reminiscent of Zürich or Geneva. The new center of town is Vabaduse väljak (Freedom Square) at the edge of the old town, and nearby is the giant matchbox of Hotel Viru, the former Intourist flagship and notorious den of Cold War intrigue (every room was tapped and monitored by the KGB!). Recently, Tallinn has received a boom in tourism, especially by daytrippers which visit it from its sister city across the Baltic Sea, Helsinki.